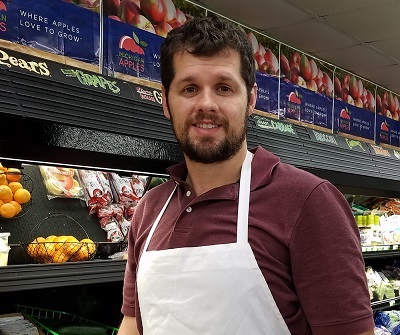 Meet your neighbor, Michael Rutan who lives in Good Hope and is the new meat butcher at R&M Market & Floral in La Harpe. Michael was born and raised in Anamosa, Iowa and graduated in 2004 from Anamosa High School. He was involved in varsity track, cross country, wrestling, and music (which included the trombone, bass trombone, jazz band, and marching band). His speech teacher was Jan Cratsenberg. Some of his more memorable previous jobs include Swing Driver at Pepsi Refreshment Services and Delivery Driver for Coca Cola. He was also a grocery manager for Fareway Stores Inc in Iowa. He worked for 3 of their stores in Marion, IA, Muscatine, IA, and Burlington, IA. His favorite department was the produce department. Michael married Rachel Goettsche in 2009. Rachel works at OSF in Physical Therapy. Michael and Rachel are the foster parents of three children: Allie (20), Mikey (18), and Daniel (14). Michael's parents are Mark and Cynthia Rutan and he has an older brother, Alan, and a younger brother, Kevin. Michael's hobbies are gardening, cooking, fixing cars, house projects and computer network security. He has spent a vast amount of time tinkering with computers. He says they attend the Union Church in La Harpe where he has met some wonderful people. Michael says they like to travel and so far have been to parts of Peru, United Kingdom, France, Italy, Haiti, Iceland, South Africa, Lesotho, Namibia and Canada as well as a lot of the United States. His future plans and motto for life, he says "is to never stop tinkering, absorbing or moving forward. The continued pursuit of knowledge and memories in conjunction with relationships is what makes life great."